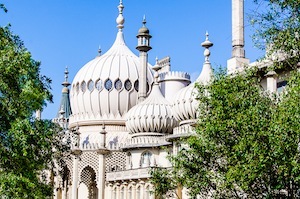 A short train-hop from London to the south coast of England brings you to Brighton — a seaside resort not to be missed! With its buzzy nightlife, beachfront cool, historic heritage, and treasure trove of quaint shopping lanes, it has long been a favorite on the visiting lists of those in the know. In the eighteenth century, Brighton burgeoned from being a small fishing village into a busy health resort catering to the wealthy. In 1783, its accessibility and its potential caught the attention of the then Prince of Wales (later to be Prince Regent and ultimately King George IV). 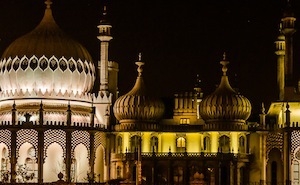 He sealed the town’s reputation as a fashionable locale by becoming a regular visitor and building the Royal Pavilion — his “pleasure palace” by the sea. King George was not one given to doing things in half measures. With a love of fashion, the arts, architecture, and good living, and little concern for frugal restraint, he spared no expense on every facet of his new residence. At first sight, the stunning Indian-style exterior, with its minarets, domes, and pinnacles penetrating the sky, is awe-inspiring. Imagine yourself, circa the 1820s, drawing up to its octagonal entrance in a horse and carriage, dinner guest of the king. After handing your cloak to a servant and perhaps taking a quick peek in the mirror, you enter a world of chinoiserie extravagance. Be prepared for the imposing grandeur. Under the instruction of George, the Pavilion interior was designed to enchant the senses and stimulate the imagination. It has a Chinese theme (fashionable at the time) and a sense of phantasmagoria — iron palm tree pillars, enormous twisting serpents, pagodas of cut glass, gilded dragons, and wood-carved objects of chimera from Oriental mythology. Above the head the theme continues on high in the stained glass of the windows and skylights. After passing through The Long Gallery you emerge into The Banqueting Room and it’s time for another intake of breath. Suspended from the ceiling and hanging over the long dining table from the claws of a dragon is a thirty-foot chandelier weighing one ton. It’s so mighty that many of the guests dared not sit under it. Titillate your taste buds by casting your eye over the king’s displayed menu: one hundred plus dishes including marinated haunch of boar, partridge encased in pastry, pheasant in truffle and wine sauce, woodcock larded with bacon — the list goes on. King George engaged the services of Marie Antonin Carême, the finest chef in Europe. The After Dinner Gallery provides cool relief after the high drama of The Banqueting Room. Here the theme becomes Regency and proudly regal and you can see evidence of commemoration to Lord Nelson’s victories. A lamp by the window depicts the Battle of Trafalgar won in 1805. After dinner, guests would relax, take liqueurs, and sometimes dance. In The Music Room further along, the great Italian composer Gioachino Rossini entertained. A visit to the king’s apartments rounds off the tour, which should take you one to two hours to comfortably fit everything in. An informative audio guide is included free with admission. If you then fancy a little light refreshment in style, make your way up the staircase to where a spacious tearoom with a balcony overlooks the palace grounds. There you can have a traditional cream tea and homemade cakes and scones, reflect on the wonder you’ve just witnessed, and plan the next phase of your Brighton adventure. Have fun!